Headlines and post titles will make you or break you. You can write killer content, but end up getting no eyes on it. Why? Because readers have to quickly filter through mountains of posts, clicking only on the titles that promise to be useful. How do they make that decision so quickly? They judge a book by it’s cover. Yep; they base their decision on the headline, because they simply don’t have time to click, load and read the first paragraph before deciding to read the whole article. They have to decide by looking at the headline. 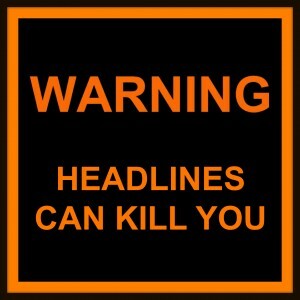 There are already plenty of good articles out there about how to write awesome headlines and post titles, so I’m going to talk a bit about writing BAD headlines; the kind of headlines that will kill you! Another content-killer is the headline that appeals perfectly to what people are looking for, but then disappoints by not delivering what was promised. Sure, you’ll get some clicks, but you’ll only generate UN-fans, and UN-followers. Bait & Switch Headlines look great, but they don’t match the content! Lose 15 Pounds in 15 Days (then the article just sells a drug, rather than explains the process). The Key to Improved Search Results (then the article gives 10 factors to juggle, without naming a “key”). How I Earned $10,000 Online by Blogging (then the article requires you to purchase the eBook). If you’re putting out the effort to create great content, then give 15 minutes to writing a headline that will give your content a fighting chance to be seen.